In the attached photo the darker/red tone trim board in the rear is what my customer is trying to match. My take was that it was Southern Yellow Pine (I also correctly or incorrectly refer to this as hard pine). The shorter sample in front is the hard pine cut off I sent him as a sample. He is of course concerned about the color difference. I do not know if he put any color or finish on the sample I sent but even if he did not it could be hard to get a decent match. Any thoughts on the original being something other than Southern Yellow Pine? I took a look at an installation of this material from 4 or 5 years ago. It is an interior staircase and it has aged to a more red tone than the sample I sent. I've suggested the customer put my sample out in the sun and see what happens. Heart Pine. Also called Longleaf Pine. It has the look of SYPine, but is redder and the latewood is very resinous. Think turpentine. This wood is rare commercially since it was overcut up until the late 30's, but is available reclaimed. Very hard, and good rot resistance. But expensive. 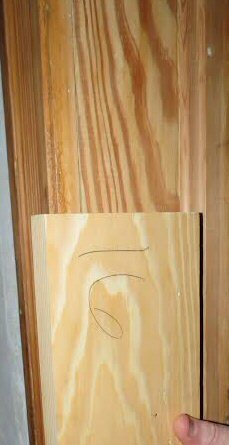 I have used SYPine as a substitute for Longleaf/Heart Pine and it works, but is not as hard (especially the earlywood) and not the same color. Hi, this is B.H's customer. The doorway sample is not treated at this time, I took off old paint with a heat gun then an old layer of varnish/stain under that with ZipStrip. By the third ZS pass it scrapped off clean, so that's as pure as the original wood can look. I'm impressed at how close the lighter part of the old wood is to the darker part of the sample. I'm going to play with some staining options this weekend. For the final treatment of the original stuff I've been using natural stain, which makes the color richer without really darkening, then gloss poly over that. Im leaning towards longleaf as well. If you cant get you hands on any a nice piece of doug fir with good heart content could work out for you. I believe it is SYPine. I layed a 1000 sqft floor 3 years ago. It has a penetrating oil finish on it. The old sample provided is pretty much an exact match. Its totally normal for the early/late wood to have such a massive contrast in SYPine. Your sample is not virgin even after you stripped it. The wood could have been layed then UV aged then finished. The stripper takes off the film. The varnish penetrated into the wood which is highlighting the early/late wood. I really like the look of SYpine. I regard it as the ideal wood shop floor. Cheap, hard and comes in 1x8 flooring. Its costs an extra 10% if the customer wants to watch, and an extra 50% if they want to help. Now that we are in this new age of social media. How much do we charge our customers to read and make comments on The Woodweb! I usually want my customers as involved in the project as possible. Since I rarely see any of them face to face this sort of interaction helps develop a trusting relationship. However, I have had to use the old line a couple of times when installing some crazy expensive thing and the customer wants to watch for the fun of it. I promise to stay away during production! Really though, the impact of having a vendor who invites engagement is huge. What I am looking for is not really reasonable under the circumstances. I need an obsolete pattern cut from a wood that no longer exists in its original form. I think the only chance I had to move ahead was finding someone who loves the craft enough to bulldoze over the obstacles. Its appreciated! The color looks like Longleaf, awful large growth rings though as compared to to the typical reclaimed old growth. That is definitely longleaf pine. You forgot the 3rd part of the equation. It costs the customer 75% more if they already started the project and gave up! Another 100% for longleaf pine. And, as already mentioned, this is second growth material: not old-growth. In my experience, the term "hard pine" is a muddling of "heart pine", which itself is a muddling of "longleaf pine". I live and work in GA. Thanks everyone. Project is all set.